With a recent delivery, finishing its first tri-deck and unveiling a new design, Italian yard Overmarine has been busy the vanguard of superyacht innovation. 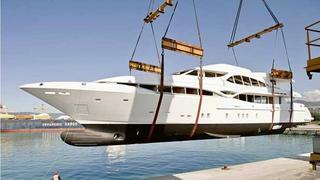 The 16th Mangusta 130, Dream Tim II, was delivered this spring. The 39.6m composite yacht is powered by twin MTU engines coupled to waterjets delivering a top speed of 35 knots. On the heels of this delivery, the Mangusta 148 Oceano arrived at the builder’s facilities in Viareggio, Italy, for finishing. This 45.5m motor yacht is a departure from the typical Mangusta open sport yacht style, but retains the sleek look of her predecessors. Stefano Righini is responsible for the exterior styling, with naval architecture by Overmarine’s in-house team. Notable features include a side garage, large stern platform and expansive indoor spaces, while keeping the GRT under 500. She is scheduled to be finished in 12 to 14 months. At this year’s Miami Boat International Show, Overmarine announced its partnership with Marine Max to market its yachts in the US. The builder also unveiled its design for the new Mangusta 205, a 62m open superyacht that will be at the top of its line-up. Righini designed her low and aggressive lines and spacious outdoor areas that include a beach club at the stern, a pool on the foredeck and a large sun deck. She will accommodate 12 guests and 12 crew with multiple layout options available. Powered by triple MTUs coupled to KaMeWa waterjets, her top speed is predicted to exceed 30 knots.